The looming question after The Avengers was always going to be if movies only featuring one of the team members would suffice after this all-star team-up and while I enjoy Iron Man 3 more and more with each viewing and appreciate it for what it did for the character I have to say the opposite of The Dark World. The Thor sequel sacrificed going through with the clear demise of a character for the sake of fan affection and in no real way contributes to the larger arc of the story Marvel seems to be telling within its criss-crossed cinematic universe. I may come to regret that sentence when either Guardians of the Galaxy or Avengers: Age of Ultron takes some big notes from the introduction of the Aether that drives the plot in The Dark World, but for now it seems that the introduction of this new energy source could have served as a small subplot in the film rather than being the main reason for conflict while also providing Malekith's sole reason for existing in the film. With The Winter Soldier though, Marvel had its back to the wall in being forced to push the narrative forward as Captain America operates within the world most of our heroes also reside and more than that is affiliated with the organization that brought the super group together thus meaning if this sequel turned out to be a place holder then there was going to be a new wave of doubt in Marvel Studios and its master plan that would feel more off the cuff than meticulously planned. Lucky for audiences, Winter Soldier is both a solid film on its own terms and a solid entry in the Marvel canon that not only moves the story forward and reveals new, unexpected developments but also sets-up an interesting dynamic for how things will unfold in the upcoming films. Within all of these films the struggle is to make a sufficient stand-alone piece that works with what it is trying to accomplish on its own and without simply leaning on the fact there is another, inevitable chapter coming. As much as these Marvel films have become big, expensive episodes in an ever-evolving cinematic version of a television series, if they were going to survive as singular pieces of entertainment they were going to need to have a strong sense of individuality and The Winter Soldier, for the first time since The First Avenger, has that singular style and tone that separates it from its cohorts while understanding the necessities of contributing to things bigger than itself. 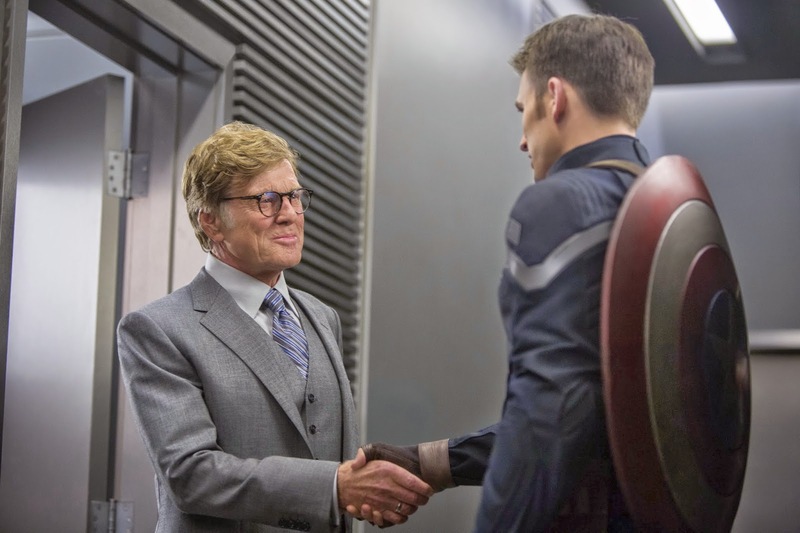 Andrew Pierce (Robert Redford) introduces himself to Steve Rogers aka Captain America (Chris Evans). The other main concern with shaping entire films around these, what came to be regarded as, more second tier super heroes was if they were in fact even interesting enough on their own to support a feature. The argument could easily be made now for Tony Stark/Iron Man especially with Downey in the lead role and Thor was such an outlandish and original beast for the already established universe that good or bad it was at least going to be interesting, but the question mark of this inquiry always seemed to land squarely on the helmet of Captain America. For all his bravery, honesty and pure earnestness he was also the most boring because of these characteristics and so it was with a lush supporting cast and that specific tone taken from the era in which it was set that The First Avenger succeeded not only in introducing us to the leader of the Avengers, but in making his story interesting as well. While many of the supporting cast from the first film have either passed on or are too old to be involved in the action that is going on here directors Anthony and Joe Russo have surrounded Cap with new allies, new enemies and a host of credible actors in these roles to make the world of S.H.I.E.L.D. feel all the more interesting than its weekly sitcom might imply it truly is. We are immediately introduced to Sam Wilson (a charming Anthony Mackie) as Cap laps him in a morning run and while not initially being recruited as a companion or "The Falcon" Wilson has a strong enough rapport with the star-spangled hero that it leaves a lasting impression important for later crisis. Scarlett Johansson returns as Natasha Romanoff/The Black Widow as the Captain's primary sidekick this go-around introducing him to the ways in which S.H.I.E.L.D. 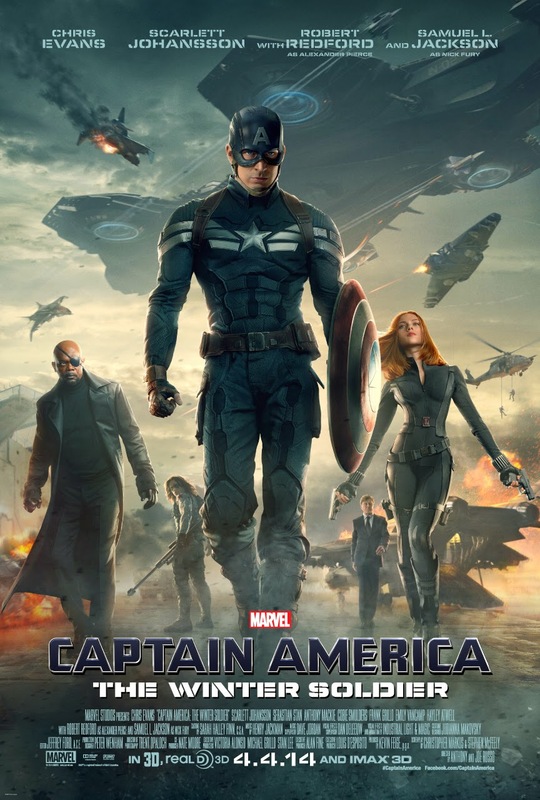 works as well as consistently trying to set him up on dates that never seem to pan out (a cute neighbor/secret agent in Emily VanCamp shows signs of sparks, but little real development as of now) while Widow and Cap share their own amount of sexual tension that just feels out of place and slightly forced. Sam Jackson is also a stronger presence here than in any of the other films given the level of S.H.I.E.L.D. involvement and even has his own intense and nicely stylized action sequence that introduces us to the titular villain. As Fury, Jackson can seem as pompous as he seems to be in real life, but luckily it fits the character and before it reaches a breaking point of not being able to stand Fury any longer there are a few redeeming moments that can only mean good things for his future involvement in this universe. What is almost more interesting than that of Cap's allies though are the villains at play here. Not to spoil anything, but if you ever thought Robert Redford would join a film that has been compared to the paranoid political thrillers of the 1970's and not somehow be involved in a conspiracy theory that involves commentary on the state of surveillance and the ability to invade individuals private lives through the ever-advancing technology we use in our day to day lives, then you had to be crazy or misinformed. The casting of Redford is a nice wink and nod to the audience that will understand it as well as being an introduction to the actor for younger generations who will hopefully be intrigued by Redford's smooth yet nasty turn as Alexander Pierce that cause them to seek out his career-defining work. Further is the subtle yet clear statement that is the casting of Frank Grillo who leads a S.H.I.E.L.D. strike force who backs up Cap and Black Widow in the opening action sequence that (sidenote) plays out the execution of the action with the utmost importance and as a result displays the full effectiveness of our heroes abilities, while also giving a very important character name to Grillo (an already underrated character actor) that allows his fate to signal that of the more meticulous planning mentioned above rather than feeling as if the screenwriters are just spinning their wheels. Lastly, we have our titular antagonist, that of Sebastian Stan's return as the Winter Soldier. I was hoping the promotional campaign for the film wouldn't give away the identity of our main villain, but there was chatter about Bucky Barnes fate as far back as before The First Avenger debuted so if there was even a remote amount of interest in these Marvel films you likely already knew who he was. While the character doesn't play as dominant a role in the plot of the film or its action as the headlining title would suggest it certainly gives more depth to the action scenes that sometimes struggle to find more justification than the pure fact they NEED to be included because this is a super hero flick. One thing The Avengers failed to do that The Dark World actually accomplished quite nicely was bringing a unique aspect to the obligatory "final battle" and with every outright action scene in The Winter Soldier the Russo brothers prove their need for real substance in their battles, they know how to pick and choose them and when they include Winter Soldier they give the tone and the meaning of the interaction between Steve Rogers and the brainwashed Bucky a pungent taste of devastation. 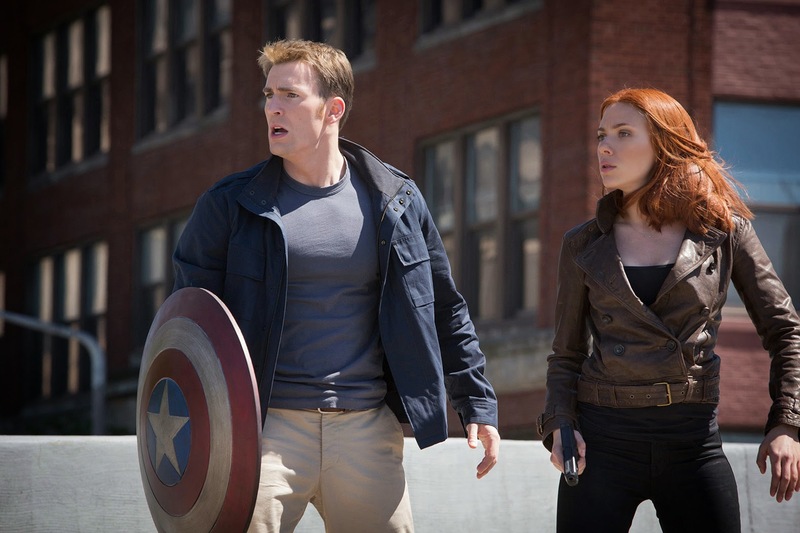 Captain America and Black Widow aka Natasha Romanoff (Scarlett Johansson) face a new foe. As the film develops into the thick of its plot though I turned to my friend sitting next to me who knows more about the comic book storylines than I do and asked if this was getting a little too far fetched. His answer was no, that he was still good, but wasn't sure how far they would take it. I wasn't sure how far they would take it either and in taking into account all that had already occurred with S.H.I.E.L.D. and the development of its own TV show I had to wonder if what unfolds was just a little too much of a stretch. In the end I'm hoping enough of my unanswered questions had been addressed to the point that even though I've given up on the NBC show I will at least be able to buy into the developments that happen in The Winter Soldier so that we have an interesting jumping of point next May when Age of Ultron opens. Again, this is what makes this in particular entry in the universe so interesting and strong in that it contains within its narrative a major development, a story all its own that the Captain is integral in unraveling and bringing to the attention of the right people to where he can follow through on the things he has always been labeled with standing for. It could very well be a stand-alone feature that simply makes larger implications that might make it even more awe-inspiring and interesting did we not already have the assurance there will not only be an Avengers sequel but a third Captain America feature as well. That is what I, personally, am looking for every time I go into one of these Marvel Cinematic Universe films. Don't get me wrong, I love the allure and the mythology that surround them and that they have come be such a part of our culture that so many of them are being made (for better or worse it is nice to see interesting filmmakers and actors take on material once thought only for children and nerds), but as the universe has grown an evident detractor has been that some of the individual films suffer a lack of suspense because audiences are already aware of what's coming next and who may or may not be able to die. The Winter Soldier, while (Spoiler!) still not able to keep any of its suspected dead actually dead, at least knows how to expertly craft a thrilling action film that just so happens to feature a Marvel super hero, and a hero, that thanks not only to that luscious supporting cast but the up-front honest and intelligently humble performance of Chris Evans has a slight advantage over those not operating directly with the organization that brought this band of heroes together. Evans, with his strong jaw and compelling nature breathes a tangible life into the clean-cut boy scout and portrays a man who we are able to believe is willing to sacrifice himself for his best friend even after being betrayed and who can also just sit back and listen to some Marvin Gaye; such an accomplishment deserves some credit and The Winter Soldier will no doubt receive that as it will likely go down as one of the better films to come out of this cinematic universe.